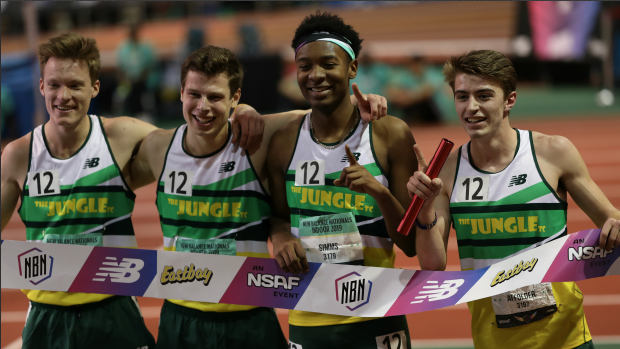 Loudoun Valley Set New DMR National Record! NEW YORK, Ny. - The Vikings of Loudoun Valley came back with vengeance this year and opened up their meet with a win and 9:54 national record in the DMR. That joins their national record in the 4xMile from last NBNI and their US #2 all-time 4x800 also run last year. This is their first DMR title indoors. The relay team was lead off by Jacob Hunter who handed it off to Akere Simms who ran the 400. It was Connor Wells on the 800 that finally gave them a big lead to handoff to Sam Affolder with a 55 meter lead. That lead was big enough to calm everyone's nerves and allow them to run their own race. The lack of pressure from competition those final laps was definitely key as Affolder closed very strong and never looked back. He broke the national record that he actually ran on when he was a freshman in PA. He ran the 1200 on that record. The team has the 4xMile and 4x800 still ahead. Interview and splits to be added later.